Faroe smacks? A MMA maneuver? A Nordic themed breakfast cereal? (It's not so crazy, there already is a breakfast cereal called Puffins.) Nope! The Faroe smacks were a fleet of fishing boats from Shetland that played a major role in the development of the Faroes as a fishing ground in the 1800s. This week, we continue our conversation with John Goodlad, who's writing a book about the Faroe smacks. 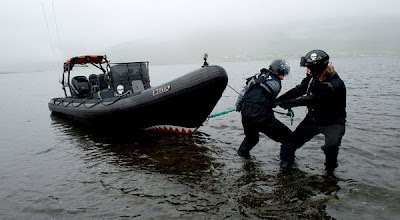 We'll talk about the boats, but it's really all about the relationship between Shetland and the Faroes and what the two places have in common, and where they part ways. Then we'll travel to a small village (pictured above) and listen to an odd verbal tic that's common in the Faroes. You can ride this bus for free! This week, we hop on one of Torshavn's red buses. You can ride them for free, and they've even got complementary WiFi. So after a few weeks of dealing with heavy topics, hop on the bus and relax for a few minutes. On this week's show, we interview Fraiser Hall and Peter Hammarstedt. They're respectively the captain and first mate of the Sea Shepherd boat "Brigitte Bardot." We talk to them about "Whale Wars: Viking Shores" and the extreme language and tactics they employ to achieve their goals. We ask if they really felt in danger while staying in one of the safest countries in the world, and if'it's ever useful to compare an entire country to the Nazis. Then we'll play a few select moments from an interview with an actual "covert operative" for Sea Shepherd.